What Makes the Fluhme Signature GLAM Wow Facial a WOW? You may have heard about the exceptional results people are experiencing at Pittsburgh’s hottest new beauty bar, Fluhme GLAM BAR. Our tag line; Get In, Get Out, Get Gorgeous is not just a tag line, it’s the results you can expect from your Fluhme GLAM Bar visit. You may have heard of our Signature GLAM Wow Facial and wondered, What Makes the Fluhme Signature GLAM Wow facial a WOW? The answer is simple, our skilled skincare specialists and Guinot’s Hydradermie Lift Treatment: The “Instant Lifting” Face Treatment! This facial treatment is like a workout for the face. It utilizes microcurrent technology to warm-up and then stimulate the muscles of the face. As with all facials, the Hydradermie Lift starts with a skin consultation and analysis. The skin is then thoroughly cleansed and exfoliated, prepping the skin for the Lift treatment. Next, an Anti-Aging Gel is applied to the skin. This gel not only works with the microcurrent, but its active ingredients benefit the skin as well. Now the Lift begins. 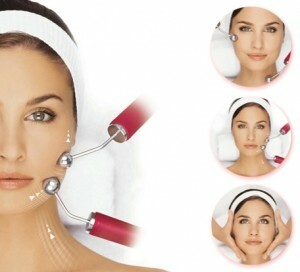 The microcurrent electrodes are applied to the face for a total of 20 minutes in 2-phases. The first 10 minutes is the drainage phase. This is where the current is set at a low level and the electrodes are moved over the skin, following the lymphatic system of the face. This is the warm-up before we workout the muscles. The final 10 minutes is the facial stimulation phase. This is where we turn the current up and workout the muscle. You will feel your facial muscles moving. The results are muscles that are more toned and skin that feels tighter. After the microcurrent is completed, a relaxing facial massage is performed to continue lymphatic drainage and drain toxins from the skin. A facial mask is applied and allowed to rest for 10 minutes. This gives nutrients and active ingredients back to the skin. The mask is removed and followed by finishing products that target the client’s skin care goals. The results from the Hydradermie Lift are visible with just one treatment. But as with all workouts, results will be continue to build with frequency of treatments. A series of Lift treatments are recommended to boost results. Interested in a gift of GLAM that will keep on giving? Purchase our exclusive GLAM Wow Series of six (6) facials for yourself or someone special for just $672.00. (20% discount) Purchase by December 24th and receive a complimentary $100.00 gift card you can use in the month of January PLUS a complimentary make-up application and 10% discount on all retail purchased on the day of your GLAM Wow Facial.